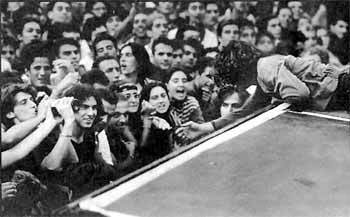 In recognition of the Italian concerts this week, this photo reaches back to Pearl Jam's shows in Italy in 1993. These appearances were generally not well-received, as PJ was opening for U2 and fans simply wanted to move on to the main act. Of course, things are different now ... Pearl Jam is headlining and the audience will be more than receptive. Notably, Ed is reaching out to the crowd, sharing his wine -- a common theme still as persistent in 2000 as it was in 1993.